How did we go from carrying our babies in slings, backpacks, and baskets to strollers designed, as Jurassic park aptly puts it, by “scientists too preoccupied with whether or not they could that they didn’t stop to think if they should”? Google “weird strollers” sometime and see what I’m talking about. 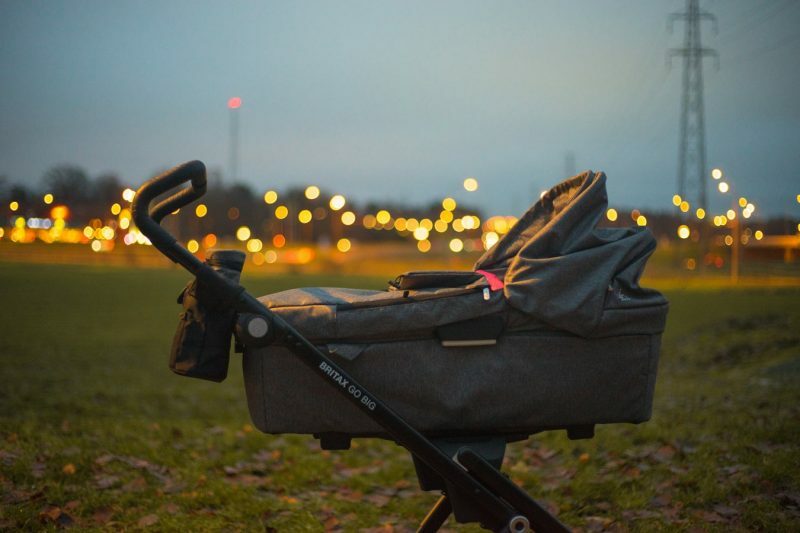 Earth to double bundle though, this article is focused on the best all-terrain double strollers with practical applications for moving your B1 and B2 about. But first, if you’re clueless about the different types of strollers as well as their features, take a look at the painstakingly researched second half of this article. 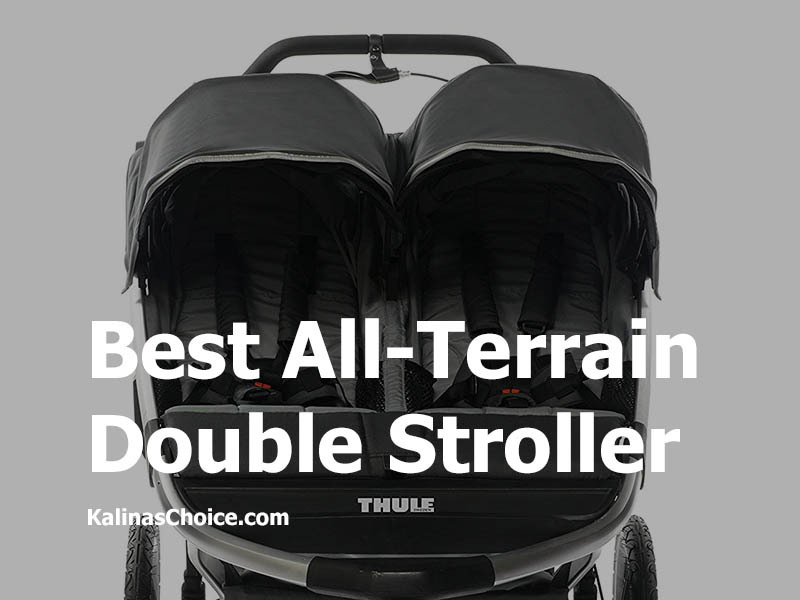 Otherwise, let’s turn to the best all-terrain double stroller products review. This BOB all terrain double stroller comes with a swivel- locking the front wheel, so you’re sure it can go from strolling to jogging. It has an adjustable suspension system for increased child comfort on rough terrains and an adjustable handlebar. Can accommodate babies from 8 weeks to 50 lbs, it’s stroller is compatible with the Britax infant car seat as well as several major brands. Air filled tires in polymer wheels, so using on a beach won’t cause rust on the frames when they come in contact with salty water. Urban Glide 2 has a swivel front wheel (12 inches) with 16 inch rear wheels. For all-terrain double strollers, the size of the wheels matters a lot in terms of feeling the effects of bumpy roads. Has a multi-position canopy with side ventilation windows for greater control of wind exposure. Has twist hand brakes. One hand compact fold. Weighs 34.2 lbs. Thule has other Urban Glide models, what makes this version different (and better if you ask me) are the huge wheels, we’ve already established that bigger is better, and the fact that it can carry up to 100 lbs (or two 50 lbs). Other Urban Glides carried only up to 75 lbs total. It has a five-point harness and a large cargo compartment. 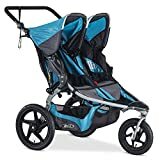 This all-terrain double stroller has the typical features of a jogger like a lock in front swivel wheels, 5 point harness, big wheels (12″ in front and 16″ at the rear). The rear brake is foot activated. Has 2 cup holders but no other attachments like trays, just meshes at the sides. It weighs 32 lbs, quite heavy but not the heaviest on our list. Remember most of the weight comes from the tires so you’ll hardly find all-terrain strollers that are lightweight. Has multi-position recline seats. Suited for children from 6 months to 50 lbs. This is the only convertible double stroller on our list. 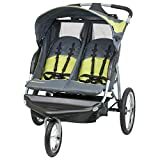 Can switch from single to double side by side stroller without being wider than a single stroller. Has a width of 24.5 inches. A handlebar is adjustable from 31 to 42. It has reversible seat liners and it can transition from full recline (for newborns) to upright position (for toddlers till 50 lbs). It is compatible with major brands of car seats like Maxi Cosi and Britax. Its measurements are 38″ × 27″ × 11.5″ it is surprisingly very heavy at 45 lbs. Some customers complained about it being a bit squishy. Remember you saw earlier that narrow widths for side by sides may mean they can’t fully grow into them. Our last double all terrain stroller review is a plush upgrade of the City Mini Series. It can carry your twins till they weigh 100 lbs. The stroller itself weighs 32.6 lbs which are average. Comes with UV 50+ sun protection and a Peekaboo window. Has a handbrake plus a padded seat which has a vested seat top that reclines. The stroller can be folded with items still attached. It is travel system compatible so it also accepts major infant car seat brands. It has a patent folding tech locking device which automatically clicks when folded. A lot of users like that it stays in place during storage and when on the road. Long story short of double strollers is that you need to pick your battles wisely. You’ve seen that although strollers come in different shapes, sizes and compatibilities, what really matters is the key feature of each individual component that suits your purpose. 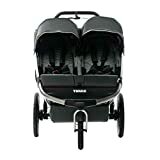 From our product review, you probably would have noted that no two all-terrain double strollers come exactly the same. So you’ll need to decide which features mean the most to you and choose accordingly. Our pick, the BOB 2016 Flex Duallie, was chosen due to its proportionate distribution of key features we think would matter for your long-term stroller use. First, we saw that side by side double strollers is more suited for twins. Then we noted that its use of air-filled high impact polymer wheels made it truly suitable for all terrains since the salty water from the beach won’t cause it to rust. It’s swivel and lock-in front wheel means you can both jog and maneuver narrow paths with it. Lastly, we pointed out that even though, by itself, it carries infants from 8 weeks, it’s compatibility with most major car seat brands means it can be turned into an efficient travel system for even week old babies. All that said, choose wisely! Side by Side: These are perfect for kids the same age as twins. Both seating compartments are beside each other with either equal or extremely similar features, so that the differences, like color and patterns, are secondary to the technical similarities. Double Jogger: Useful if you have an active lifestyle. The wheels, weight, and brakes are designed to accommodate running along with two kids. However, as you’ll see later, this isn’t meant to be used for newborns. So you might get this when they’re a little older (about 6 months). Tandem (In-line): One seat is usually placed in front of the other in a stadium-seating style in one single file. Although this isn’t used for kids of the same age because the seating areas may be different. One might offer more legroom, recline better or have more accessories than the other. Some have reversible seating adaptors so the kids can interact with one another. Umbrella Strollers: These are the lightest and least expensive strollers on the market. They’re more or less like fabric slings only they don’t provide the adequate head and back support newborn babies need. Its light weight makes it really easy to steer as well as fold into your car trunk. Suitable for taking on vacations but not for all terrains. One of the reasons they’re light is because they have small tires which are only suitable for smooth terrains. Convertible Strollers: Usually come as a single but can be converted to a double by adding a second seat sometimes even a third sit and stand seat. Note that while this type may appear cheap initially, the extra parts usually need to be purchased separately so the costs may add up. Travel System: This just refers to strollers that can accommodate infant car seats to the stroller’s base. This way, you’ll be able to move your babies from the car to the stroller without waking them up. If you know how grouchy babies are when interrupted from their naps, you’ll know that twins are even double the trouble. Side note, sitting in a car seat for too long (more than two hours) can cause flat spots on the back of a baby’s head. So try not keep them strapped in for too long. So far you’ve seen the types of strollers available mainstream. Just because they’re listed separately doesn’t mean they’re mutually exclusive. It’s actually quite possible to find a side by side umbrella stroller with travel system compatibility. So carefully note what a brand is offering before buying. This next section goes into more detail about the attributes and specification of each part of the stroller. Once you understand this detailed info, you’ll be able to judge for yourself whether or not you need certain things, like a stroller with a polymer wheel. For the clearer understanding, this part is divided into; ease of use, maneuverability and child safety. See our review of big kids strollers. This is mainly concerned with how well you handle the stroller, so it serves a more parent-centered purpose. Ease of use will be determined by the handlebar, weight and storage space of the stroller. What’s A Good Handlebar Height? If you and your partner are poles apart, height wise, the taller would have to stop if the handlebars are low while the shorter would have to kick up the back of the stroller (tilt it upwards) if the handlebars are too high. The best strollers usually have adjustable handles with different height settings. Some handles are even padded to make it more comfortable for long period use while others include wrist straps so your baby doesn’t roll away when you let go. What’s A Good Weight For A Stroller? You already have at least two kids so you probably don’t need the extra workout from carting around a heavy stroller. While you may be tempted to ditch heavy strollers entirely due to their increased difficulty in maneuvering (more on this later) and lifting, they do offer other benefits lightweights don’t. Right now the focus is on how easy it is to move the stroller about. Usually from your car trunk. It’s a no-brainer that lightweights like umbrella strollers are easier to fold. Their wheels are usually small, less heavy and lightweights don’t have as many accessories that are accommodated by all terrains. Another feature that makes folding a breeze is whether it’s one hand and self-standing. One hand are common but self-standing aren’t. So choose accordingly. Carrying an additional handbag isn’t always advisable because of the temptation to leave it on the handlebar (can tilt your stroller with your baby in it depending on the weight). This is to occasionally observe how your babies are doing without having to turn around thus stopping the cruise mode they might have been enjoying. The windows, located on the canopies, are usually made with either magnetic latches (less noise when used) or velcro ones. The bottom line is that while ease of use isn’t always a deal breaker for most parents since child safety and comfort is a priority, it can make the whole stroller baby bonding experience frustrating. You can lose your desire to spend time outdoors when you think of the difficulty of operating a stroller. What Type Of Wheel Makes A Good Stroller? A good stroller for you may be terrible to someone else. So it’s all about knowing what will suit your lifestyle. 4 or mall terrain wheelers are very common because of how well balanced they are. They have very small wheels and are suitable for smooth paths. They can be a bit hard to push through so only choose this if you will use on smooth surfaces. 3 wheelers, however, have larger tires and are easy to steer on rough surfaces. The bigger the tire the smoother the ride. Plastic tires are usually foam filled so they don’t need high maintenance (pumping). They’re great for concrete jungles with no need for heavy duty navigation. Rubber tires are like the air filled ones usually found on bicycles. And just like bikes, they can travel on virtually all terrains. This type of tire loses air naturally just by being so they need to be pumped regularly to avoid flat tires. Tires with inner tubes are easily damaged when the ram pressure of the wheel is off or the rim is damaged. Manufacturers usually include instructions on how much to inflate your tire (check per square inch -PSI). Tubeless or Pneumatic tires are best suited for jogging since no tubes equal fewer tire problems when you’re going fast. Bicycle or tubeless sealants are an overall best way to ensure your tire remains inflated despite punctures. Fixed wheels lock-in so they are great for moving in one direction while swiveling wheels are easy for everyday maneuvering. The best all-terrain double strollers will usually come with a lock-in option on a swiveling wheel. This way you can convert them from strollers to joggers. You can get away with having metal wheel frames if you don’t go to the beach. But if you do, a polymer is best since they won’t become rusty after several trips in the salt water beach. Just remember to hose down your stroller after every beach visit. Suspensions make a ride smoother on your baby. So they are a must for all terrains. All-wheel suspensions are great features to look out for. Strollers for smooth terrains don’t necessarily need them. Most brakes on strollers seat on a tray at the rear wheel. What you should check to see is how flipflop friendly yours is. Other brands place brakes on the handlebar. While some include active hand brakes- like those on a bicycle, useful if you live on a hill or if you jog since they’re sensitive. One other useful brake you’ll find on really good brands is the autostop brake. It automatically engages when there isn’t any tension on the handle so the stroller stops moving. Width: How Wide Is Too Wide? You won’t notice how narrow spaces are until you have a side by side stroller. While single files are narrower, width wise, they’re usually lengthy which can make steering tough. Single files are also not very suitable for twins since the babies are split up. Your options are thus to find the side by side with the narrowest width. Note that smaller side by side width may mean your babies use them for a shorter than average amount of time since it can become squishy as they get bigger. With strollers, you really just need to pick your battles. This is obviously the most important feature since no amount of extra feature will make up for putting your babies in danger. Here, we’ll discuss harness, seat compatibility, canopy, and fabric used. Babies tend to wiggle a lot so a good harness will be easy to clip on. At this point in our history, it would be weird not finding all-terrain strollers that don’t have padded harnesses. Especially if they’re suited for newborns. 5 point harnesses are one of the safest. So a good harness should be 5 points padded with easy clipping. Strollers either come with their own accessories or make it easy to attach other brands’. If you already have a car seat, ensure you check the stroller’s manual for a list of compatible brands. This is very important because some strollers don’t accommodate car seats, even though their seats aren’t suitable for newborns like some umbrella strollers. Some will have recline positions to accommodate infants while others have additional adaptors. If you think the sun’s too harsh on your eyes while strolling, your babies probably think so too. The way a canopy shields will usually be affected by its angle. A flat overhead won’t shield the eyes of your babies. That’s why you find most canopies looking like extended boxes. For double strollers, check that it isn’t just one giant canopy. If one child loves the sun, you’ll have trouble trying to enjoy your walk in peace. Most strollers use cotton, partly due to its ability to dry out moisture from the skin. But in cooler climates, wool and leather may be more apt. Remember to pick your battles! Not every stroller will come with everything you want. But make sure you test out the buggy before buying. You can simulate your baby’s weight by stacking up books. This will probably be the final determinant of how suitable a stroller is for you. Photo by Thule, Modified by Author.